From the other end of the pool in the balmy natatorium, I watched Marco Millevoi with a mixture of awe and dread. The very picture of concentration, he was focused on the small whiteboard in his hands. He had just got out of the pool. His hair was still dripping. His chest was red. A pair of racing goggles dangled from the waistband of his swimsuit. It was early October in southern Rome and the water polo season was young. Marco seemed determined to get his team off to a fine start. According to Claudio, a friend from the gym who suggested I give the sport a try, the team was one of the best amateur water polo squads in all of Italy. I approached Marco, counting the meter markers as I crossed the deck. “I think I’d like to play water polo,” I said in broken Italian. “Not much,” I told him. I dashed off to the locker room and changed in a hurry. Back on the platform, Marco called me forward and introduced me to the team, a posse of young Italian men sporting intimidating muscles. To a man, they glowered at me, all except for my buddy Claudio, who smiled nervously, perhaps regretting that he’d ever told me about the team. Marco read out lane assignments, dividing the guys into four groups based on speed. As the crowd around me dwindled, I waited to hear my name called out. When it didn’t come, I approached Marco. “Why don’t you swim over there,” he said, pointing to an area beyond the last lane where a couple of abandoned kick boards drifted aimlessly. I walked away, past Claudio, and lowered myself into the water. I was bummed. After all, I am an excellent swimmer. I even taught swimming at the University of New Orleans during grad school. But as Marco barked instructions and the Italians sawed into the water, I began to see the shunting for what it was, an act of mercy. The Italians were flying through the water. I tried to follow suit. Lap after lap, turn after turn, their strokes only sharpened, their speed steadily increasing. For the next hour, I swam for my life, hoping Marco wouldn’t notice the laps I was cutting. I refused to quit. I swam farther and faster than ever before, and right at the moment when I thought I was going to pass out, practice ended. Or so I thought. As I clung to the edge of the pool, trying to keep from vomiting in the water, two players hopped out, removed the lane ropes, and set up goals at each end of the pool. Marco divided us into two teams then passed out swim caps with hard plastic domes over the ears that made us look like Princess Leia in a speedo. The headgear was secured under the chin by laces, which took a good 20 minutes for me to tie. Still breathing deeply, I joined the subs on the side of the pool and tried to figure out what was going on. The guys were treading water in a strange eggbeater motion, both hands above the surface. With one hand they caught and threw passes. With the other they fended off multiple attackers. Each team had six players, five of them arranged in a semi-circle and one, who seemed to be a kind of player-coach, wading in the middle. He was called, I soon learned, the centroboa. I watched in awe as these leviathans of the water powered up and down the pool. They fired passes and pulled one another underwater all the while vying violently for the ball. When the centroboa called out orders, his teammates responded, shifting positions and setting screens. When a shot rocketed toward the net, the goalies shot from the waves to waste high, deflecting one laser shot after another. Suddenly I realized someone was calling my name. It was Marco. “You’re in,” he said. Reluctantly, I paddled into position. The ball was hurtling my way, a slippery comet on a collision course with my face. I caught it, and for the tiniest fraction of a second, felt pleased with myself. That was the amount of time it took for the defenders to swarm. 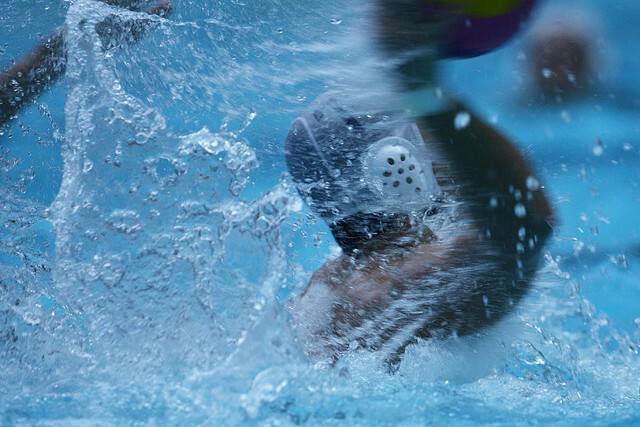 They ripped me into the depths and, as I thrashed about to keep from drowning, I lost possession of the ball. Study I did. I swam on my own for miles and miles. I spent hours treading water with no hands, lunging left, then right, forwards and backwards. I memorized plays and formations. I became fluent in Italian water polo lingo: Bicicleta (Tread)! Tira (Shoot)! My refusal to quit seemed to make an impression on the other players. As the weeks passed, they began greeting me by name, roping me into conversation. There was Paolo the banker, Alessandro the student, Daniele the trainer, and Maurizzio the IT guy. They invited me into their lives. In the pool, more often than not, they laughed with me, not at my expense. One Tuesday evening five weeks after my first practice, I dressed and headed for the last lane of the pool, a space that had become my second home. Before I jumped in, Marco stopped me. “Why don’t you swim over here from now on,” he said. He pointed to my left, where Alessio, Francesco, and Stefano–the slowest swimmers on the team–bobbed in the water. I was taken aback. I had been promoted from the sidelines to the slow lane. Even if it was the bottom rung, it felt good, at long last, to be on the ladder. In scrimmages, I learned how to fight and scrap. I was spending more time above water than below. I was developing physically as well, burning tens of thousands of calories a day. The team was very good, borderline great. They had won the past five regional championships. In games, Marco played me sparingly, when our lead was large and the damage I could inflict was minimal. One tournament after another, we destroyed every team in our path. In practice, my speed in the pool increased. Marco bumped me up to the third lane. I became an ace at fighting and defending myself in ten feet of water. I could swim and tread for 45 minutes without rest. It was June. The tournament that would decide the regional champion was looming. By this point, we were the top-ranked team in central Italy. My B-team status was no longer a shield of safety. In practice, I was expected to give the starters a run for their money, to help prepare them for the stiff competition that lay ahead. In the last practice before the championship, I took my place in the number four spot, near the top of the semi-circle. I was pitted against Daniele Porcelli, one of the strongest players on the team. All night I stayed in his face, swimming till my lungs ached, trying to match his pace. Finally, with time running down, and my team on offense, I came around a screen set by Claudio and found an opening. As if on cue, a teammate fired the ball my way. With every ounce of remaining strength, I leapt out of the water, caught the pass, and in one fluid motion launched the ball towards the goal. The ball skidded off the waves and careened toward the net before I crashed into the water. When I resurfaced, everyone was staring, mouths agape, in my direction. I had scored a goal. Sure, it had happened in a scrimmage game, but I didn’t care and neither did my friends. The natatorium swelled with cheers and the echo of cheers. Even Captain Marco applauded. The team would go on to win the regional championship, the sixth in so many years. But when I think back to that season, I return in my mind to the natatorium, to the waning seconds of that inconsequential scrimmage game, to the ball leaving my fingers and hurtling on a collision course with the empty net. For an athletic experiment that began naively but became one of the great experiences of my life, it was the perfect coda, the fistful of glory I carried away from those grueling, waterlogged months spent splashing around on the outskirts of Rome.